Tom Sullivan, M.A.L.D., owner of Pollinators Welcome, designs, consults, speaks publically, writes, educates and develops products for pollinators and their habitat. Tom focuses on native bee proliferation by increasing nesting sites, meadow grasses and flowers, and connectivity among habitat fragments across the landscape. Tom recognized that whole ecosystems and human health were intertwined with pollinator well-being. A beekeeper in his youth, Tom switched his interest from non-native honeybees to native bees in 2008, just as Colony Collapse Disorder (CCD) was emerging as a serious threat to human nutrition. His response to CCD was through public speaking, writing, and educating about the plight of bees, the most efficient pollinators, to help reverse this crisis. Tom’s designs, primarily using native plants, function both ecologically and fit aesthetically into the landscape. Mainly using native plants, he welcomes pollinators while allowing ample space for human activity. At home Tom mixes native plants with handsome cultivars. Here the warm embrace of an over-arching apple tree releases into a small lawn edged with sun loving pollinator attracting plants. In this photo, his client’s next door neighbor, inspired by Tom’s pollinator-attracting meadow design, decided to leave substantial areas of lawn un-mowed — soon was revealed what had been suppressed by mowing. In 2011, Tom designed the first pollinator habitat nursery in MA, that has attracted the NRCS, USFWS, and the Xerces Society for the Conservation of Invertebrates. 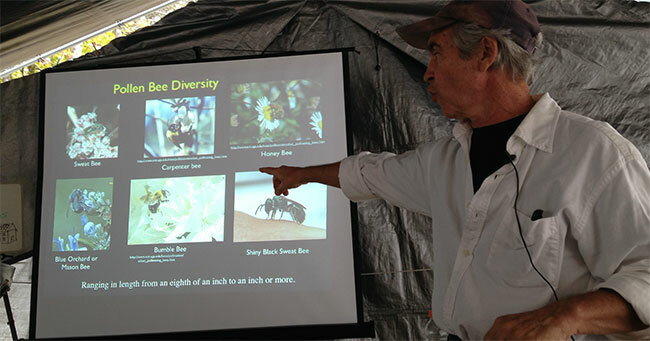 To date 3o species of native bees have been identified at That’s A Plenty Farm, Hadley. This client’s suburban yard was ripe for pollinator enhancement. 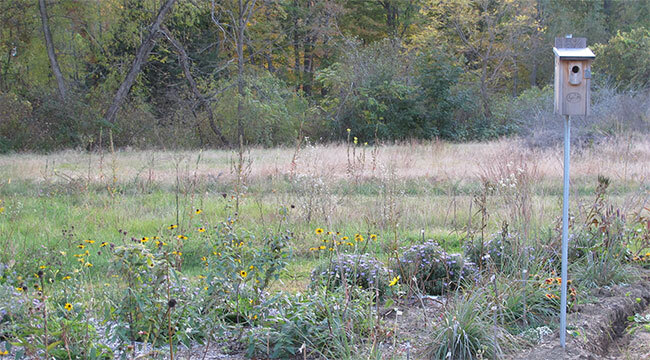 Here three quarters of this grass-dominated property became a rich array of pollinator plants. Tom’s habitat design on a busy street draws attention to the beauty of wild flowers, their arrangement and their bee and butterfly attractiveness. Pollinators Welcome designs marry ecological function with aesthetics. Here this suburban farmer wanted to do all she could to increase pollinator diversity and abundance. Tom’s consultations help landowners and land managers decide on the most effective enhancement strategies for boosting existing populations and accommodating a wider array of pollinator species, as well. Tom gives talks at schools, festivals, nature centers, farm organizations, and garden symposiums, to people of all levels of education, and landowners of large and small acreages. 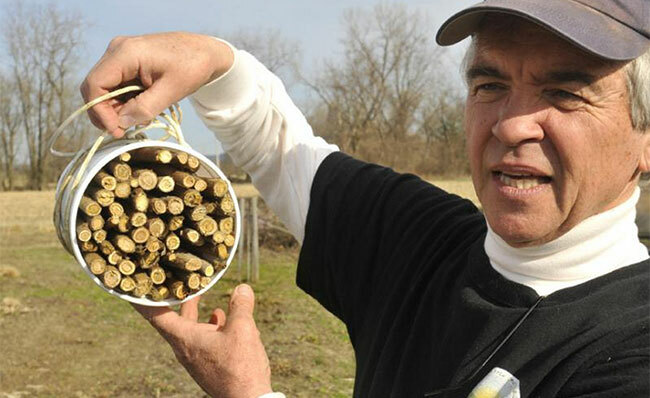 He offers guidelines and techniques to spark bee habitat creation and enhancement at residences, parks, farmland, and other open spaces. Garlic and Arts Festival 2013 Orange, MA. Tom’s hands-on workshops teach simple techniques to extend pollinator resources that empower attendees to make room for pollinators in their community. 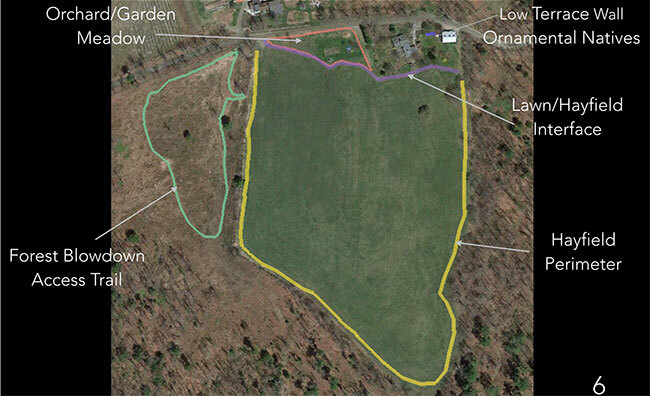 Though no meadow is too small, Tom teaches connectivity from small to larger parcels where previously disjointed pollinator habitats join a greater field. 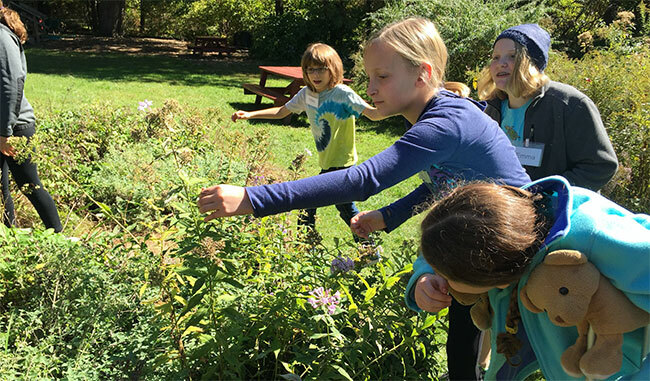 Fifth and sixth graders from the Common School (Amherst, MA) observe bumblebees gathering nectar from late-blooming asters. “Petting Bumblebees”, safe when they’re busy foraging. Tom’s passion for bee survival sparked a line of products he designed to support pollinator proliferation and habitat connectivity throughout the northeast. 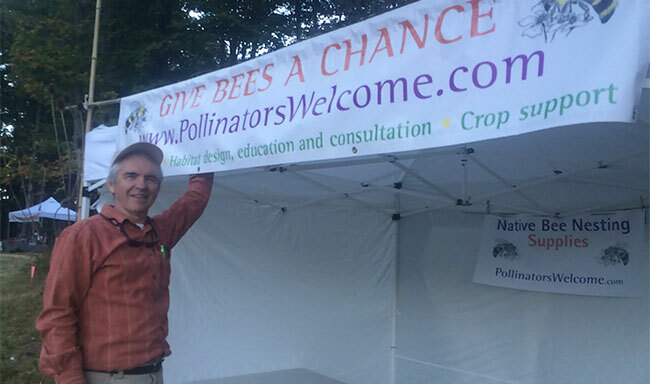 Since 2013, Tom has given talks and sold native bee habitat products at the Garlic and Arts Festival in North Orange, MA. Pollinators Welcome partnered with a team of developmentally disabled adults, who farm at Prospect Meadow Farm, to assemble his products. These products provide much needed native bee tunnel-nesting resources, and give meaningful skill development to community members who work at ServiceNet’s (Hatfield, MA) Community Supported Agriculture farm. 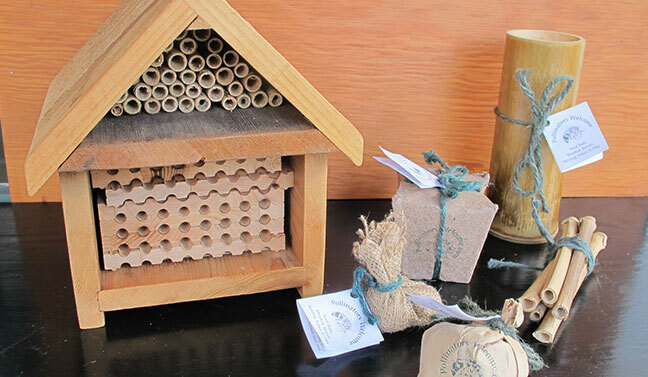 PW product line: Nest house, clay pouch, seed ball satchel, Meadow Burst and Bamboo Nesting Tubes. An article Tom wrote for the Daily Hampshire Gazette. After receiving his Masters of Arts in Landscape Design in 2008, Tom has studied native bee identification with USGS monitoring expert Sam Droege, at the National Conservation Training Center in Sheppardstown, WV; with Frank Drummond, PhD and Allison Dibble of U. of Maine; Robert Gegear, PhD from Worcester Polytech; and with his mentor, wildlife biologist and native bee expert Joan Milam. Tom’s background also includes: community garden organizing and working with teens to “Save The Parks” in Chester, PA; interning at The Rural Education Center where he helped start Stoneyfield Farm’s first yogurt plant; and leading the Frederick Law Olmsted Capital (Horticulture) Crew in the Emerald Necklace park system surrounding Boston. Pithy shrub stems attract small Ceratina carpenter bees to nest in them. Here the stems are within a shelter ready for a place to be securely hung. 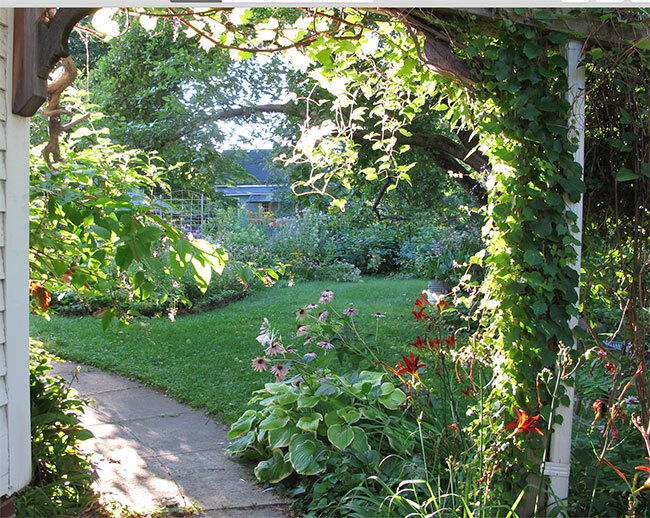 “Green Hero of the Month by the Greening Greenfield Committee, Greenfield, MA. “Efforts at Improving Franklin Park” as horticulture leader of the Frederick Law Olmsted Capital Crew, given by the Friends of Franklin Park. © 2019 Pollinators Welcome. All Rights Reserved.